Le Petit Belloy is located in the heart of Paris, near the lively Latin Quarter, Boulevard Saint Germain and Notre Dame Cathedral. Pocket WiFi is available at an extra charge. This air-conditioned room offers satellite TV, free WiFi and a private bathroom with a shower. Facilities for making tea and coffee are provided. Please note this room includes two connecting rooms with the option of twin beds or a king bed. This air-conditioned room offers satellite TV, free Wi-Fi and a private bathroom with a shower. Facilities for making tea and coffee are provided. Rate: € 128.00 ... € 164.00; select dates below to get current rates. 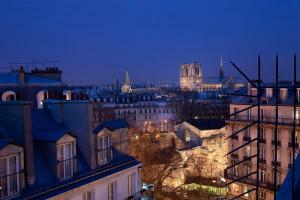 With views of Paris, this air-conditioned room offers satellite TV, free Wi-Fi and a private bathroom with a shower. Facilities for making tea and coffee are provided. Rate: € 112.00 ... € 278.00; select dates below to get current rates.